Berry is a region located in the center of France. It was a province of France until départements replaced the provinces on 4 March 1790, when Berry became divided between the départements of Cher (High Berry) and Indre (Low Berry). 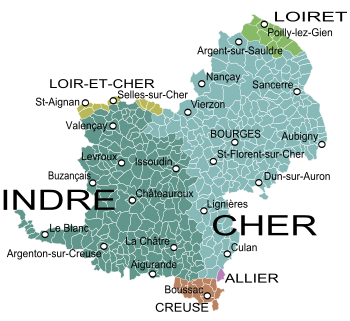 The Berry region now consists of the départements of Cher, Indre and parts of Creuse. The city Bourges functioned as the capital of Berry. Berry is notable as the birthplace of several kings and other members of the French royal family, and was the birthplace of the famous knight Baldwin Chauderon, who fought in the First Crusade. In the Middle Ages, Berry became the centre of the Duchy of Berry. It is also known for an illuminated manuscript produced in the 14th–15th century called Les Très Riches Heures du Duc de Berry. The name of Berry, like that of its capital, Bourges, originated with the Gaulish tribe of the Bituriges, who settled in the area before the Roman armies of Julius Caesar conquered Gaul. La Brenne, located west of Châteauroux and east of Tournon-Saint-Martin in the Indre department, is a region which of old straddled on the former provinces of Berry and Touraine, and is now a protected natural area (Parc naturel régional de la Brenne) as well called Pays des mille étangs, because of its many ponds created since the 8th c. by the monks of the local abbeys for pisciculture. ^ Compare: Miroglio, Abel; Miroglio, Yvonne-Delphée, eds. (2012) . "Berrichons". L'Europe et ses Populations [Europe and its peoples] (in French). The Hague: Martinus Nijhoff. p. 157. ISBN 9789400997318. Retrieved 31 December 2017. [...] en fait, Berry vient de Bituriges ; ainsi se nommaient les ancêtres gaulois des Berrichons. Le premier nom de Bourges fut Bituricum. This Centre-Val de Loire geographical article is a stub. You can help Wikipedia by expanding it. Cher is a department in the Centre-Val de Loire region of France. It is named after the Cher River. 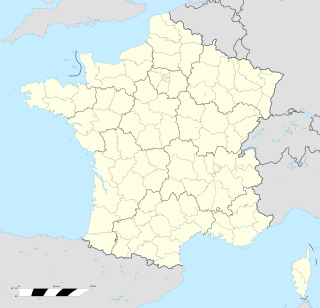 Centre-Val de Loire is one of the 13 administrative regions of France. It straddles the middle Loire Valley in the interior of the country. 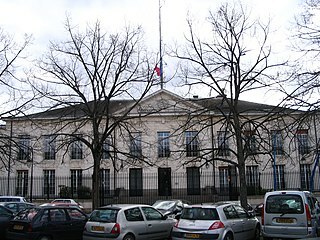 The administrative capital is Orléans. Saint-Benoît-du-Sault is a commune in the Indre department in central France. The Parc natural régional de la Brenne is an 1,672 km2 (646 sq mi) large Parc naturel régional located in the Indre département of France. It was founded December 22, 1982. Of old, La Brenne was a region in the old French provinces of Berry and Touraine, west of Châteauroux and east of Tournon-Saint-Martin. The park is cut in two by the Creuse River. Through the southern half flows the Anglin River. Historically, the southern part of the regional park is not really part of La Brenne. This part is called La petite Brenne. Historically, it was part of the Boischaut region.